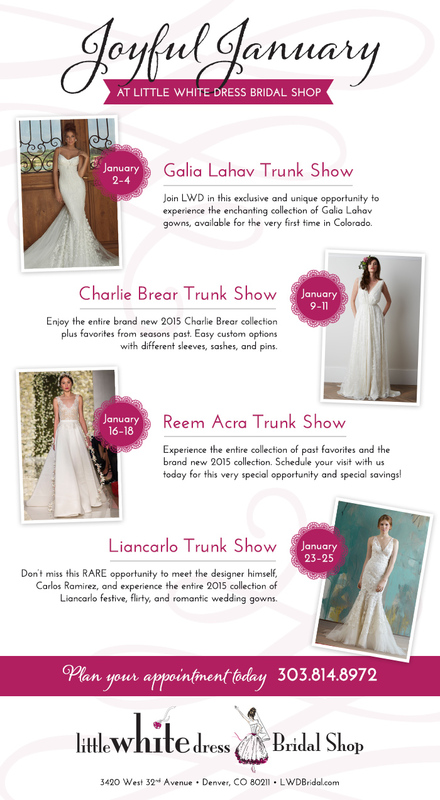 We're kicking off 2015 with a long list of exciting events at Little White Dress Bridal Shop in Denver! It's the perfect time to find your wedding dress, with trunk shows for brides of every style and budget throughout the month of January. Galia Lahav's exquisite, enchanting gowns will be available for the very first time in Colorado, January 2nd-4th at Little White Dress. Experience the understated sophistication of chic London designer Charlie Brear, January 9th-11th. Don't miss Reem Acra's gorgeous, elegant collection of gowns January 16th-18. And last but not least - choose from the spectacular new Liancarlo collection AND meet the designer himself, January 23rd-25th. Call 303-814-8972 or visit our website to schedule your appointment!